MovieTickets.com Book of Life Sweepstakes – Win a $3,000 American Express gift card! Win a $3,000 American Express gift card! ELIGIBILITY – This Sweepstakes is open to any individual who, as of the beginning of the Entry Period (a) is a legal resident of the continental United States (excluding Alaska, Hawaii, Rhode Island, Guam, Puerto Rico, and all other U.S. territories and possessions) (the “Eligibility Area”); (b) is eighteen (18) years of age or older; (c) has access to the Internet; and (d) is a registered user of MovieTickets.com. SWEEPSTAKES PERIOD – The Sweepstakes entry period begins on September 29, 2014, at 11:00 a.m. Eastern Time (“ET”) and ends on October 19, 2014 at 11:59 p.m. ET. PRIZES – One (1) Grand Prize is available. The Grand Prize consists of: one (1) $3,000.00 American Express gift card). The total of the grand prize is $3,000.00. Ten (10) Second Place Prizes are available. The Second Place Prize consists of: (a) one (1) Funko’s Pop! The Book of Life Figure – Set of 5 (ARV: $49.95); (b) one (1) The Book of Life T-shirt (ARV: $15.00); and (c) one (1) Fox Blu-ray 5-pack (Mr. Peabody and Sherman, Rio 2, Epic, Walking With Dinosaurs, Turbo) (ARV: $75.00). Total value of each prize is $139.95. Eight O’Clock Coffee “Coffee With Friends” Scratch & Win Sweepstakes – Win a trip to Los Angeles! ENTER SWEEPSTAKES HERE – Eight O’Clock Coffee Facebook page. ENTRY LIMIT – One entry per person, per hour. SWEEPSTAKES PERIOD – The Game will start at 12:00:01 AM Eastern Daylight Saving Time (“EDT”) on September 29, 2014 and will end at 11:59:59 PM EDT on September 29, 2014. 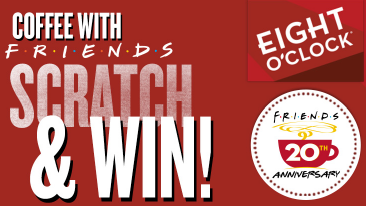 PRIZES – ONE HUNDRED (100) Coffee With Friends Scratch & Win Sweepstakes Prizes: Each Coffee With Friends Scratch & Win Sweepstakes Prize consists of one (1) Central Perk brought to you by Eight O’ Clock Coffee T-shirt (one size fits all) and one (1) eleven ounce (11 oz.) bag of Eight O’ Clock Coffee. The approximate retail value (“ARV”) of each Coffee With Friends Scratch & Win Sweepstakes Prize: $16.99. 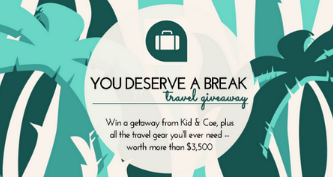 weeSpring You Deserve a Break Travel Giveaway Sweepstakes – Win a getaway and baby travel gear! Win a getaway and baby travel gear! ENTER SWEEPSTAKES HERE – weeSpring Sweepstakes page. ENTRY LIMIT – Earn entries by completing social media tasks. ELIGIBILITY – This Sweepstakes is open to legal residents of the 50 United States and the District of Columbia who are eighteen (18) years of age or older at the time of entry, have access to the internet at the time of entry and who visit http://www.weeSpring.com. PRIZES – (Getaway isn’t listed in the rules, but is mentioned on the entry). 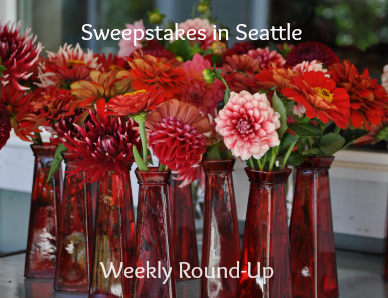 Sweepstakes in Seattle Weekly Round-Up 9/28 – Win a $1 Million Dollar Annuity, a trip to Maui , gift cards & more! Happy Fall! It certainly felt like fall this week with all the cloudy, rainy days. I even made a batch of caramel popcorn (one of my favorite fall treats). In case you noticed, not much happened on the blog on Thursday or Saturday – they were a couple of sick days for me, but I’m hoping I’ll be feeling better soon. Check out all the great sweepstakes we had last week and watch for some fun ones next week. Remember, Sundays I will only post the weekly round-up so you can get caught up and see if you missed any of the sweepstakes posted during the past week. Have a great Sunday and check back tomorrow for new sweepstakes! I’ll also share winner’s stories here, so if you win a prize, let me know and you can be a part of the weekly round up! – No winners to report this week. Quicken Loans Hole-in-One-Sweepstakes – Win $1 Million Dollar annuity! Win $1 million dollar annuity (will only be awarded if a hole-in-one is made on the 10TH Hole of the Quicken Loans National)! ENTRY LIMIT – Limit: One (1) Registration and one (1) On-site Entry per person, regardless of method of Entry during the Sweepstakes Period. Bonus Entries: Upon completion of your Entry into the Sweepstakes, Entrants may invite friends to PGATOUR.com, QLNational.com or the Quicken Loans Facebook fan page to complete a Registration and receive one additional Entry into the Sweepstakes for each friend invited that subsequently registers for the Sweepstakes (“bonus entries”). Limit ten (10) bonus entries per entrant. Entries, On-site Entries and bonus entries together shall herein be referred to as (“Entries”). ELIGIBILITY – The Quicken Loans Hole-In-One Sweepstakes is open to legal residents of the fifty (50) United States (including the District of Columbia) who are eighteen (18) years of age or older as of date of entry. SWEEPSTAKES PERIOD – Sweepstakes begins on May 19, 2014 at 12:00 p.m. Eastern Time (“ET”) and ends on December 6, 2014 at 11:59 p.m. ET. PRIZES – If a hole-in-one is achieved on the 10th hole of the Quicken Loans National Tournament, One (1) Grand Prize will be awarded: USD$1,000,000 in the name of the Grand Prize Winner, payable over the course of forty (40) years in forty (40) equal annual installments of $25,000. IF NO HOLE-IN-ONE IS MADE ON THE 10TH HOLE OF THE QUICKEN LOANS NATIONAL, THE GRAND PRIZE WILL NOT BE AWARDED. (Grand Prize Approximate Retail Value, based on annuity’s present day value: $208,289.04). For each hole-in-one achieved during the participating PGA TOUR tournaments as indicated in the chart above, one First Prize winner will receive one year’s mortgage payment, consisting of 12 months of principal and interest only, awarded in the form of a check in the name of the winner (or parent/legal guardian if winner is deemed a minor in his/her state of residence) (minimum $6,000 to maximum $12,000each). Mortgage account holders must provide proof of one year’s mortgage payment in order to receive that amount (up to $12,000). Non-mortgage holding winners’ prizes will be determined by a random drawing of all eligible mortgage amounts starting from $6,000 to $12,000, and the selected monthly mortgage amount (up to $12,000) will be awarded to that corresponding winner. IF NO HOLE-IN-ONE IS MADE ON ANY HOLE OF ANY PARTICIPATING PGA TOUR TOURNAMENT (AS INDICATED IN THE CHART ABOVE), NO FIRST PRIZE WILL BE AWARDED. Second Prize (60 – ten per month as described above): 60 Second Prize winners will be selected (10 per month) to win one month’s mortgage payment, minimum $500 to maximum $2,000 each (principal and interest only). Mortgage account holders must provide proof of one month’s mortgage payment in order to receive that amount (up to $2,000). Non-mortgage holding winners’ prizes will be determined by a random drawing of all eligible mortgage amounts starting from $500 to $2,000 and the selected monthly mortgage amount (up to $2,000) will be awarded to that corresponding winner. Crazy Cuizine LOVE Sweepstakes – Win a trip to Maui! Win a trip to Maui (airfare & hotel)! ENTER SWEEPSTAKES HERE – Crazy Cuisine Facebook page. ENTRY LIMIT – Limit: You may enter one (1) time per Week during the Promotion Period. ELIGIBILITY – Crazy Cuizine LOVE Promotion (the “Sweepstakes”) is open only to legal residents of the forty-eight (48) United States and the District of Columbia (excluding New York and Florida) who are at least eighteen (18) years old at the time of entry. SWEEPSTAKES PERIOD – The Sweepstakes begins on September 8, 2014 at 12:00 a.m. Eastern Time (“ET”), ends on October 20, 2014 at 11:59 p.m. ET. PRIZES – ONE (1) GRAND PRIZE: Two (2) $1000 airline gift cards to be used toward airfare accommodations from a major airport near winner’s home (determined by Sponsor in its sole discretion) to Maui, HI. The Grand Prize also includes five (5) nights’ accommodations at Aston Kanaapali Shores Resort Maui or a hotel determined by Sponsor in its sole discretion (single room, double occupancy). 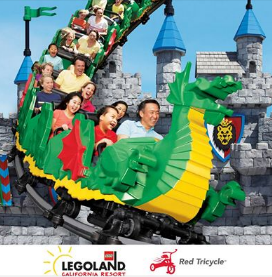 Winner must complete the trip within one (1) year from the drawing date or prize will be forfeited. Travel must be round trip. Approximate Trip (airfare & hotel) Retail Value (“ARV”): $4,470. Twelve (12) free product coupons that can be used toward any Crazy Cuizine product, up to $10 for each coupon. Coupons expire December 31, 2015. ARV: $120. Twelve (12) 20-22 ounce boxes of free product. Each box will consist of a single Crazy Cuizine entrée. ARV: $120. SEVEN (7) SECOND PRIZES: One (1) free Crazy Cuizine T-Shirt. ARV: $10. 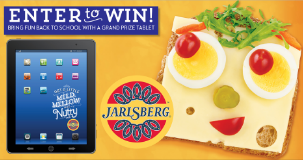 Jarlsberg Back to School Sweepstakes – Win a tablet! ENTER SWEEPSTAKES HERE – Jarlsberg Facebook page. ELIGIBILITY – Open to all US residents age 18 and over. SWEEPSTAKES PERIOD – Giveaway begins August 6, 2014 at 8:00:00 AM ET and ends on October 31, 2014 at 11:59:59 PM ET. PRIZES – Weekly prize is a lunch bag and water bottle (total approximate value $15). One grand prize of a tablet computer (approximate value is $400). Avocados from Mexico Hungry for Football Sweepstakes – Win a $500 grocery gift card! Win a $500 grocery gift card (20 winners)! To enter by text: During the entry period, text ‘SCORE’ to the short code ‘467467’ and tap the link in the reply text message, then tap the ‘ENTER SWEEPS’ button and complete the mobile entry form in its entirety and submit. You must include the name of your regular supermarket. Upon submitting a completed online entry form, you will receive one (1) entry into the Sweepstakes. ENTRY LIMIT – Limit one (1) entry per person/per email address/phone number per day, regardless of method of entry for the entire Entry Period. ELIGIBILITY – The Sweepstakes is open to legal residents of the 50 states of the United States and D.C., who are 18 years of age or older at the time of entry. SWEEPSTAKES PERIOD – This Sweepstakes begins at 12:01 a.m. ET on September 22, 2014 and ends at 11:59 p.m. ET on December 15, 2014. PRIZES – There will be four (20) Grand Prizes awarded. Each Grand Prize consists of a $500.00 Grocery gift card to the store named on winner’s online entry form. Win $4,000 in Disney gift cards! ENTRY LIMIT – Limit of one (1) entry per person, per email address per household during the Entry Period. ELIGIBILITY – This Sweepstakes is open to any individual who (a) is a legal resident of the continental U.S. (Alaska, Hawaii, Guam, Puerto Rico, and all other U.S. territories and possessions and all Overseas Military Installations are excluded); (b) is eighteen (18) years of age or older; (c) as of the beginning of the Entry Period, has access to the internet, and (d) a registered member of MovieTickets.com. SWEEPSTAKES PERIOD – Entries must be received by 11:59 PM ET on October 12, 2014. PRIZES – One (1) Grand Prize is available. The Grand Prize consists of (i) eight (8) Disney Gift Cards in the amount of $500.00 each (“Gift Card”). The approximate retail value (“ARV”) of the Grand Prize is $4,000.00. Five (5) Second Place Prizes are available. The Second Place Prize consists of: (a) one (1) Alexander and the Terrible, Awful, No Good, Very Bad Day poster; (b) one (1) Alexander and the Terrible, Awful, No Good, Very Bad Day chalk mug; (c) one (1) Alexander and the Terrible, Awful, No Good, Very Bad Day jumbo highlighter; and (d) one (1) Alexander and the Terrible, Awful, No Good, Very Bad Day stress relief alligator. Total ARV of each Second Place Prize is $50.00, with an aggregate value of all Second Place Prizes of $250.00.